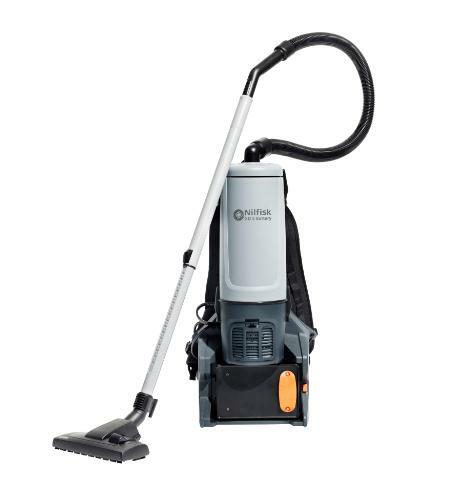 The Nilfisk GD 5 Battery vacuum cleaner offers all you need to get the job done faster - leaving the need for cords and power outlets behind you. The backpack design will let you work with ease! Being compact and mobile, the Nilfisk GD 5 Battery will deal effectively with dust in facilities with limited space between seats, tables, and shelves. The machine is an ideal choice for cafes, restaurants, shops, cinemas, auditoriums and conference rooms, as well as transportation. Adding to this extreme mobility, the machine has a long runtime and best in class charge time of only 40 minutes to ensure an extraordinary productivity. Switching between two 36V Lithium batteries will enable you to work non-stop. Just put it on and get going!